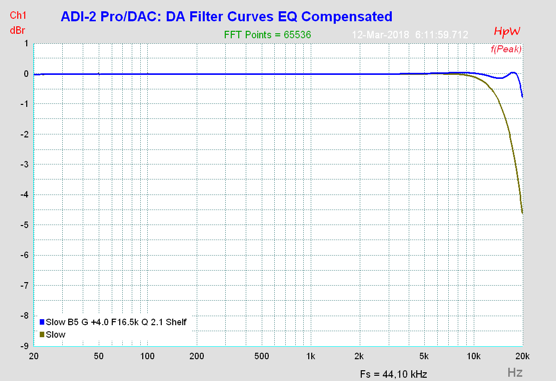 I am interested in using the Slow filter option on the ADI-2 DAC for its good impulse response, but the rolled off treble in the audible range and imaging down to pretty close to the audible spectrum when using 44.1 kHz sample rate is not what I want. Is this something that can be cured by upsampling my music to say 176.4 kHz and then also using the DAC at this sample rate? The manual only shows frequency response for 44.1 kHz, so I don't know what happens at higher sample rates. I am also a bit unsure about the lowest possible image frequency in this case. I think it would be 154.05 kHz (sample rate 176.4 kHz minus 22.05 kHz as the highest possible frequency in my source files), would the DAC even be able to output that? Also, would impulse response somehow get worse again when upsampling? 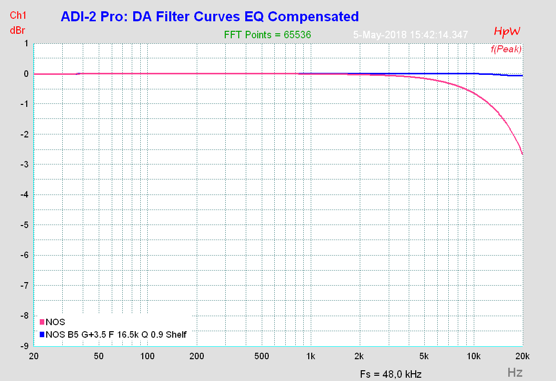 As you can imagine with only 3 and 4 dB gain this is just a slight change, it linearizes NOS perfectly, and Slow good enough. Now the point is that the Shelf filters have only small impact on the impulse response. Basically Slow stays Slow, and NOS stays NOS. See these two pictures, comparing original (red) with EQ'd (blue) result. From single to quad speed (up to 192 kHz) the filters stay the same, they just double/quadruple in corner frequency (they move out of the hearing range), and the ringing is halve/quarter in time length. Above 192 kHz the DAC always uses Slow, this is a fixed function. But the point is a different one: whenever you upsample the data has to be filtered. This filter is exactly the same as when using the DAC itself in Single Speed, and can also be seen in the upsampled result. So you gain nothing. 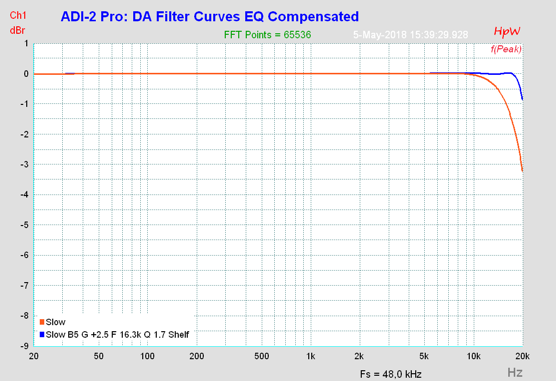 At 192 kHz there is no real argument against a steep filter, no matter if SD Sharp or Sharp. There will be no 96 kHz signal in your audio material that would make them ring. And even if then you are not able to hear this short, low level 96 kHz signal. Thank you for the EQ settings. I will test them once my unit has finally arrived. I thought the treble roll off was important in getting the impulse response, but this looks very minor. Am I correct to assume the settings for the Slow filter will also work for the SD Slow filter, given their frequency response is virtually identical up to 20 kHz? So the small impact on the impulse response is true only for shelf filters (and not for Pick, High/Low cut) ? 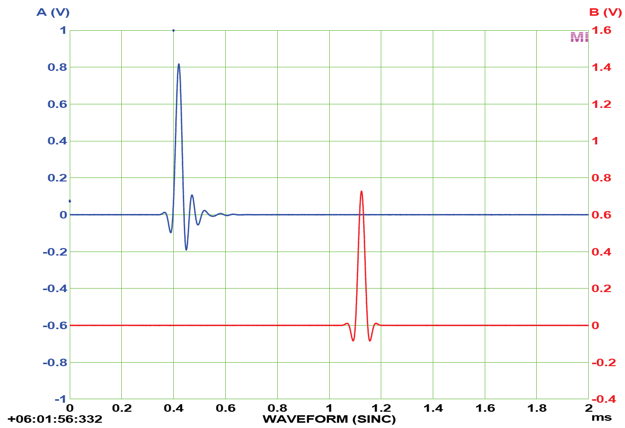 Yes, peak filters usually cause more ringing than shelf filters when used in an application like this one, correcting the frequency response near the Nyquist border. Thanks, good to know. So much things to learn. But I'm happy to learn ! any EQ-recommendations for 48 kHz, 88 etc (in the NOS-mode)? At 88 kHz there is no need to correct NOS anymore, IMHO. And the record EQ setting is exactly the same for Slow as shown above. For 48 kHz I will check. by the way, why RME calls super-slow filter of 4490 as NOS ? Actually NOS-DAC's are differrent story. Explained in the manual. Seeing the stairsteps and the massive aliasing effects it is bad enough to be called that (the reason that we made it available at all is that the oversampling is reduced, but not completely gone. Therefore the filtering is still there, weaker than with Delta-Sigma, but more than real NOS. It's an interesting approach, and the side-effects are tolerable in certain applications). But the point is: the Pro is a Pro tool. Calling a filter 'SuperSlow' has no meaning for anyone. Imagine someone transfers precious recordings through an analog chain, uses the Pro (or DAC) as DAC, processes it, records it again at Hi-Res. Then a year later the engineer discovers that all transfers are completely messed up with high frequency noise, aliasing, and even the expected response in the higher treble lacks. Then that guy is fired and our reputation completely destroyed. In HiFi people can do to the music whatever they like, it's their fun and usual has no serious consequences, right there at the end of the chain. In a studio environment R2R and NOS are an absolute no-go. So is 'SuperSlow'. As expected the higher frequency response of 48 kHz sample rate helps making the frequency response even more linear up to 20 kHz as with 44.1 kHz sample rate. And here are the impulse responses for these EQ settings, comparing original (red) with EQ'd (blue) result. Danke! This is really a very useful correction! but what about the HD-signal? I must disable the EQ or will there be any presets for it, too? The simplest thing to set in the unit is setting the high and low frequencies. For Slow 10kHz to + 3.2db. For NOS 3.5kHz to + 2.5db. Get the same smooth frequency response up to 20 kHz. Does the correction apply to "SD Slow" as well? If not can we have correction data for SD Slow as well if it needs it? response and lowest latency. 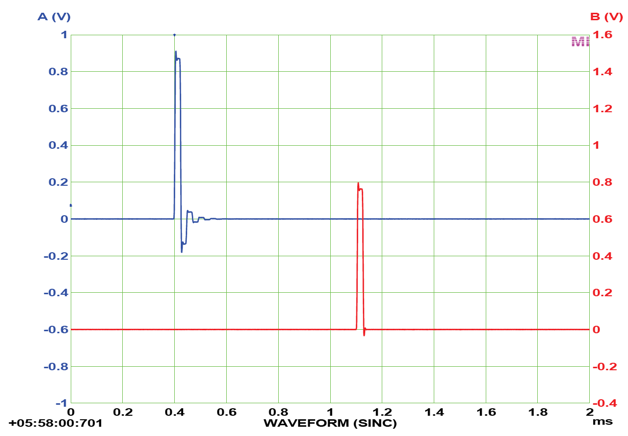 SD Slow causes a small drop in the higher frequency range. Thanks for the note (I had received your mail to Support already). Yes, the word 'Slow' is missing. SD Sharp / Sharp and SD Slow / Slow have the exact same frequency response, so the EQ settings work for both. Does the DAC require any EQ'ing for 96kHz>? P.S I love this DAC, it has replaced my Chord Hugo 2! The Slow and NOS filter do not need EQ at sample rates higher than 48 kHz, as the attenuation happens outside the hearing range then. "From single to quad speed (up to 192 kHz) the filters stay the same, they just double/quadruple in corner frequency (they move out of the hearing range), and the ringing is halve/quarter in time lengt". "whenever you upsample the data has to be filtered. 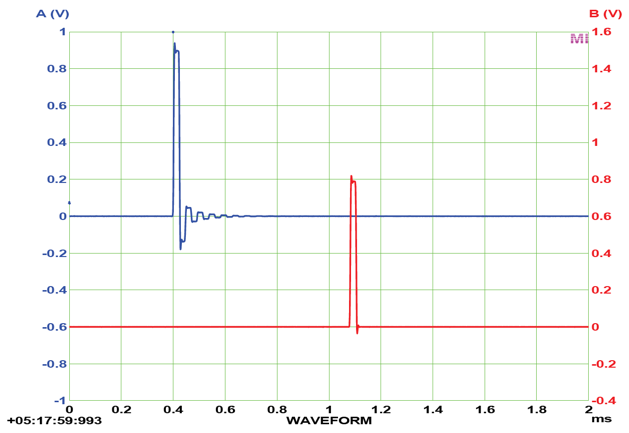 This filter is exactly the same as when using the DAC itself in Single Speed, and can also be seen in the upsampled result. So you gain nothing". The underlined parts of the two sentences appear inconsistent in my view. As MC says in post #2, the upsampling filter does exactly the same as the DAC for single speed data: remove content above the single speed Nyquist-frequency. Thus, the impulse response and frequency response are dominated by those of the upsampling filter. 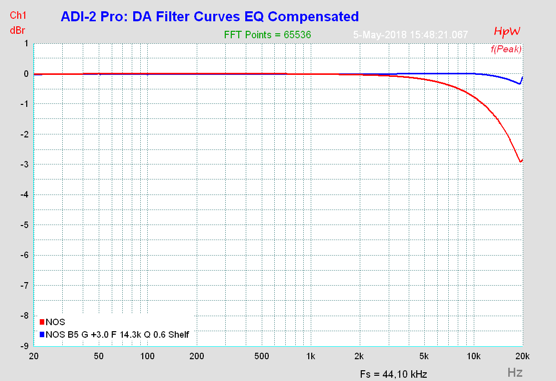 If you upsampled using a slow (shallow) filter, the HF attenuation is similar to that of the DAC's slow filter and you will need EQ to increase HF extension. Ah ok...you (and MC of course) mean the interpolation low pass filter (at single speed Nyquist frequency) in the upsampling process. Right, my lapse of memory. 1. When use files whith sample rate 44.1kHz output must be equalized for high frequency dropdown reason. Valid for Slow or NOS filters. 3. Streams higher 192kHz have only slow filter by default. If frequency response have audible dropdown with 44.1/48 sampe rate streams why dont implement correction in dac firmware? Why user must be do it itself. And next question. How to view dynamic status of this corrections when switched from different files. Example. User done eq correction for 44.1 next switch to 48 done it for 48, next play 192 ets. Its not good for home users. This is good for profi whith one type of files used in one session on DAW. Ones time set and working. Maybe add this corrections to dac firmware?